Diamonds, it has long been said, are a girl’s best friend. But a research team including a physicist from the National Institute of Standards and Technology (NIST) has recently found* that the gems might turn out to be a patient’s best friend as well. The team’s work has the long-term goal of developing quantum computers, but it has borne fruit that may have more immediate application in medical science. Their finding that a candidate “quantum bit” has great sensitivity to magnetic fields hints that MRI-like devices that can probe individual drug molecules and living cells may be possible. 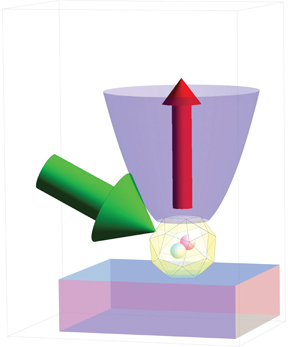 The candidate system, formed from a nitrogen atom lodged within a diamond crystal, is promising not only because it can sense atomic-scale variations in magnetism, but also because it functions at room temperature. Most other such devices used either in quantum computation or for magnetic sensing must be cooled to nearly absolute zero to operate, making it difficult to place them near live tissue. However, using the nitrogen as a sensor or switch could sidestep that limitation. Diamond, which is formed of pure carbon, occasionally has minute imperfections within its crystalline lattice. A common impurity is a “nitrogen vacancy”, in which two carbon atoms are replaced by a single atom of nitrogen, leaving the other carbon atom’s space vacant. Nitrogen vacancies are in part responsible for diamond’s famed luster, for they are actually fluorescent: when green light strikes them, the nitrogen atom’s two excitable unpaired electrons glow a brilliant red. The team can use slight variations in this fluorescence to determine the magnetic spin of a single electron in the nitrogen. Spin is a quantum property that has a value of either “up” or “down,” and therefore could represent one or zero in binary computation. The team’s recent achievement was to transfer this quantum information repeatedly between the nitrogen electron and the nuclei of adjacent carbon atoms, forming a small circuit capable of logic operations. Reading a quantum bit’s spin information—a fundamental task for a quantum computer—has been a daunting challenge, but the team demonstrated that by transferring the information back and forth between the electron and the nuclei, the information could be amplified, making it much easier to read. * L. Jiang, J.S. Hodges, J.R. Maze, P. Maurer, J.M. Taylor, D.G. Cory, P.R. Hemmer, R.L. Walsworth, A. Yacoby, A.S. Zibrov and M.D. Lukin. Repetitive readout of a single electronic spin via quantum logic with nuclear spin ancillae. Science, DOI: 10.1126/science.1176496, published online Sept. 10, 2009.